The Miss International Queen 2018 Talent Quest & National Costumes Presentation Presented by Krungthai-AXA Life is hosted at Aksra Theatre King Power. All proceeds, from today’s event, go to the Excellent Centre for Organs Transplantation (ECOT), King Chulalongkorn Memorial Hospital, the Thai Red Cross Society. Dazzling the audience are the pre-screened contestants from 10 countries. The ladies came on stage in their National Costumes, miraculously conveyed the meaning of cultures of their home country. The entire Hall roared, like never before. 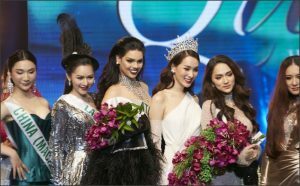 Miss International Queen has become the world’s platform for Equality. It is not merely beauty to the eyes but it is also importantly about true identity – sharing voices for acceptance and a foundation for values. Equality is not just for transgender but it is deemed for the World – World Equality, where people should be treated equally despite the differences. The 27 contestants from 27 countries, this year, share the common goal of bringing the World Equality to attention. From today onwards, the ladies are to fulfill other interesting activities: tour of the city of Bangkok, visit the temple of Emerald Buddha, experience the ride of Tuk-Tuk (famous Thailand’s rickshaw), river cruise on the Chaophaya River and many things to do for friendship and Thailand tourism. You are invited to follow the ladies and find out who will be the next crowned Miss International Queen 2018. The final round will take place on the 9th March at the Tiffany’s Show Theatre, Pattaya city. The fans can also enjoy the pageant “Miss International Queen 2018” via GMM25, LIVE Streaming through www.gmm25.com, Application GMM25 and Live Facebook at GMM25 Facebook Fanpage or www.facebook.com/MissInternationalQueen and www.MissInternationalQueen.com starting 22.00PM.